If you apply for a position with a large company, your resume will probably be scanned electronically by an Applicant Tracking System or ATS. According to one ATS company, 75 percent of all resumes submitted do not make it past the screening, no matter how qualified the candidate may be. What can you do to make sure that your resume makes it past the ATS and into the hands of the recruiter or hiring manager? In the past, ATS systems counted keywords. Now the technology is more sophisticated. Loading up your resume with keywords is no longer enough to ensure a high score. Today’s ATS systems look for semantic matches. These are terms related to the keywords contextually and conceptually. • Include the same words from the job description in your resume, including job title, description headlines, words used more than twice, and those used to describe the criteria for success in the position. • Include secondary resume keywords, such as the hiring company’s competitors or experience you have with similar or competitive brands. • Include keyword phrases which means surrounding the keywords with other related words. • Include notable industry qualifications such as training and professional associations. • Use the job-related words throughout your resume, not just under one job. • Call your work experience just that: Work Experience. ATS systems do not recognize phrases like Professional Experience or Career Achievements. • When listing your employment history, start with the employer’s name, followed by your title, followed by the dates you held the job. Each can go on its own line. Never put the date of employment before the employer’s name. • You may want to leave your address off your resume if you are not within easy commuting distance from the job. Some ATS systems may give candidates who live far from the job lower scores, even though a long commute may not matter to you. • As some ATS systems are looking for an exact match for the job title, some experts recommend including a single, centered line in bold below your contact information which states that you are seeking a position as (job title), with (company name) and the job reference number. Using the company’s name in your resume may get you additional points. • Putting more information into your description of your activity at each job could make it easier for the ATS system to evaluate you accurately. • Use the acronym and the spelled out version of titles, i.e. Certified Public Accountant (CPA). • Watch your spelling. A human being can figure out what you mean if you make a mistake but the ATS cannot. 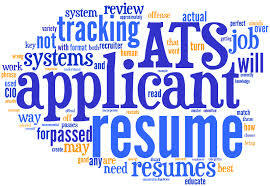 • Never send your resume as a PDF because ATS systems lack a standard way to structure PDF documents. • Do not use background images or photos which can block the ATS and make your resume unreadable. • Use bulleted lists, not paragraphs which are harder for the ATS to decipher. • Do not use scripts, designer fonts, tables, logos or graphics. • Do not use continuous lines across the page. Some ATS systems read this as the end of the page and move on without recording the information on that page. • Avoid large fonts as some ATS systems are set not to read point sizes larger than 14 or 16. • Do not “hide” keywords in your resume using light colored fonts (this can get you branded as a cheater). • Do not use headers or footers as they cannot be read by most ATS systems. • Have plenty of white space in your resume so that it is easy to scan or read. • Cut and pasted text can “choke” the ATS. Therefore it is best to upload your resume, NOT cut and paste it into a text box if that is an option. There are differences of opinion about the first section of your resume. Some experts advise you to use this section to define yourself as a specialist. Instead of using generic terms like management, operations, communications, or marketing, use specific relevant category expertise. For example: client relationship management, revenue growth, risk management, negotiation or CRM Program Development. Others recommend dropping the Career Objective section altogether and replacing it with a qualifications summary, bullet-pointed, containing lots of keywords. A concise summary of your top achievements, major skills and important experiences allows you to direct the content to what you think the recruiter is looking for. A Long or Short Resume? Some experts say that the length of the resume does not matter. A longer resume which allows you to include more keywords and phrases may work in your favor. However, others say that the scanners can be set to read only the first page therefore you must make sure that all your keywords appear there. One author recommended both a short-form and a long-form resume. Use the short-form for online submission. Your short form should include your most current skill sets and only four accomplishments, each with a net result (CAR story), each including the name of the company you worked for, your title, dates and role. At the bottom of your short-form, add a list of job description-related keywords in 8pt. For an example of this type of resume, go to: http://www.cio.com/documents/pdfs/SAMPLE%20Jerry%20Job%20Seeker%20Short-Form%20Resume.pdf. Whether you choose a shorter or a longer resume, keep a running list of keywords, phrases and jargon related to your target jobs. Use these as needed to build the semantic connections that will up your resume ratings. Nice article with some good advice but I also just found a site called http://www.jobscan.co which analyzes the job description automatically and identifies the most important keywords for your resume for you, which I think is pretty interesting. All you have to do is copy and paste your resume with a copy of the job description, then jobscan does all the work. Saved me so much time because it literally only takes a few seconds and I’m pretty sure I got more interviews because of jobscan. I definitely recommend it as well!